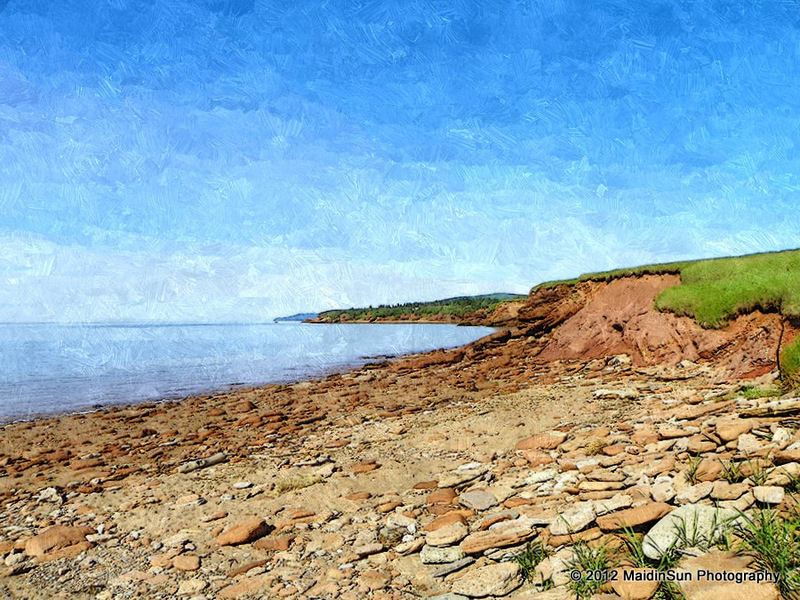 The photo was taken on my recent trip to the Canadian Maritimes at Dennis Beach in New Brunswick. I altered the photo, giving it a painting-like effect, in FotoSketcher. I’ve had it sitting here as my desktop image for a few days and every time I look at it, I hear and feel the crunch and squeak of rocks underfoot as I carefully make my way across the larger rocks down to the sand where walking is much easier. The “barefoot shoes” are Vibrams which simulate barefoot walking. You feel everything underfoot without the ouch factor of actually being barefoot. ooh definitely a beach on which one should wear shoes! Glad you told me about your modifications – for one horrified moment I feared someone had sat there and painted all those rocks! a lovely spot and somehow the painting look brings it very much to life. Now I’m to check out FotoSketcher although, often, that type of software leaves me feeling a bit lost. FotoSketcher is pretty simple to use. It doesn’t have tons of options to chose from like some of the other editing programs.